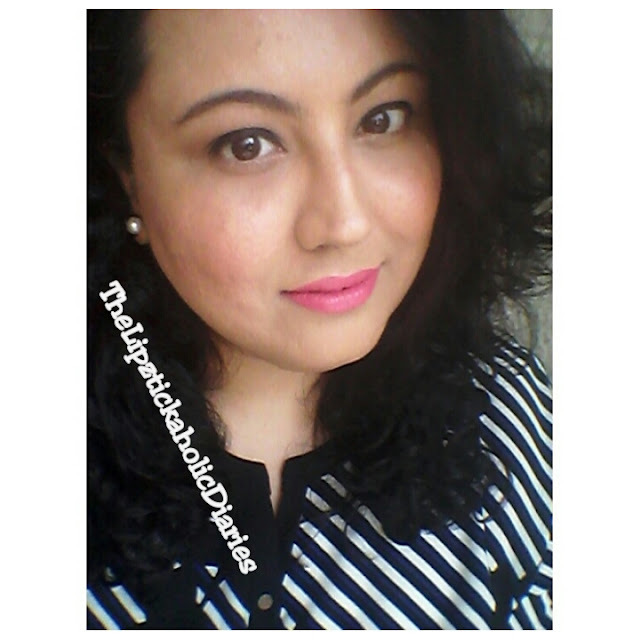 I feel like it's been ages I reviewed a lipstick. So here I am today, reviewing this recent purchase. I first saw the swatches on a blog that I follow & ever since wanted to have this in my kitty. Let's see what I thought about this one & if it was worth the hype around it. Shade: It's a bright coral pink, with slightly orange-ish undertones, when compared to the rest of the shades in the range. Texture & Formula: The texture is nice & creamy. 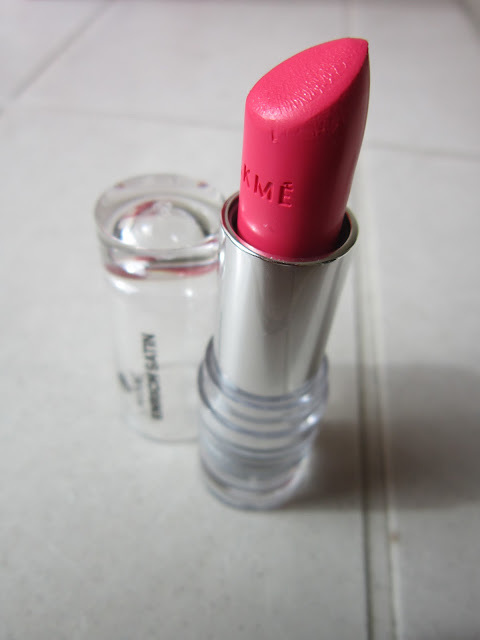 Its comfortable on the lips though I'd strongly suggest exfoliating your lips before using this lipstick. The creamy formula can get into fine lines & also cling on to the dry, flaky bits of your lips. Pigmentation: The pigmentation is really good; just one swipe gives you full, opaque colour! Wear-time: It's not really a long wear lipstick & lasts for about 2-3hrs before it starts fading. 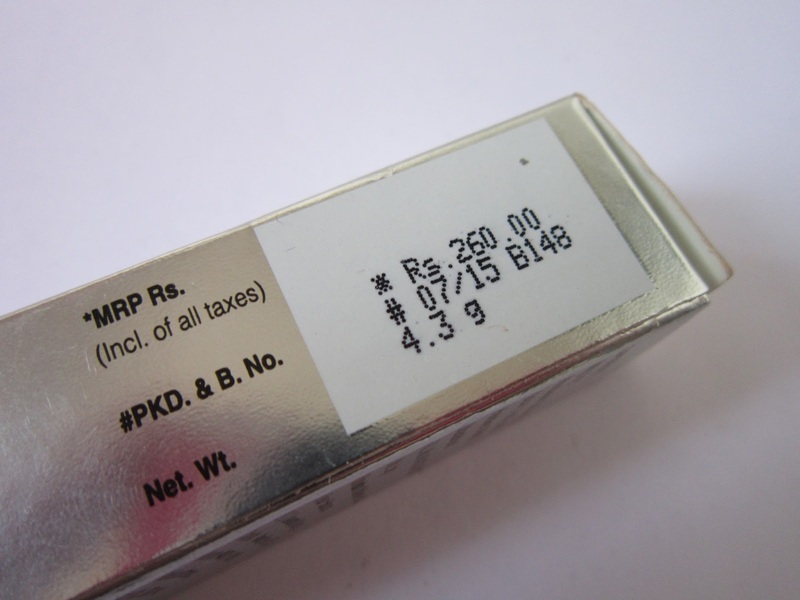 Its not a non-transferable formula and hence will transfer & start fading once you have had something to eat or had a sip of water. It fades from the inner part of the lips and fades evenly. But Oh.My.Gawd. (Yes yes, like Janice from Friends!! )...the staining power of this lil lippie amazes me. It fades to leave behind a stain, almost as bright as the lipstick itself. This means lesser touch-ups (I'm kidding, I'm so lazy I don't believe in touch-ups ;-) lol) for working girls & busy moms!!. Well, honestly, I see myself using this lipstick as a stain more than a full-on application!! Overall experience: It's a beautiful day-time shade. 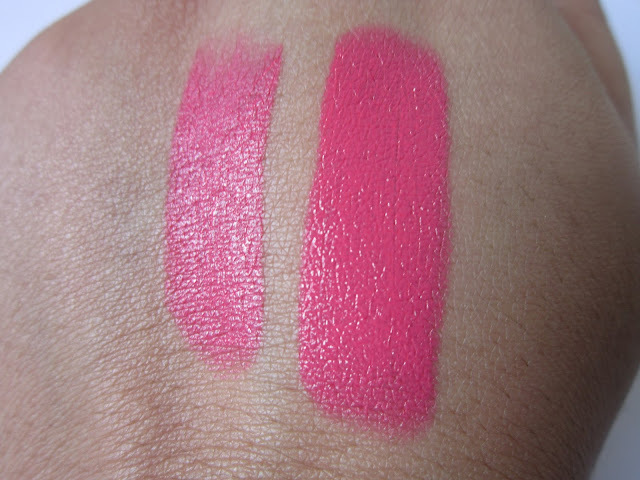 I have heard it's a dupe for MAC Impassioned, but since I don't own Impassioned, don't take my word for it :-) What do you think? Leave me a comment about it. 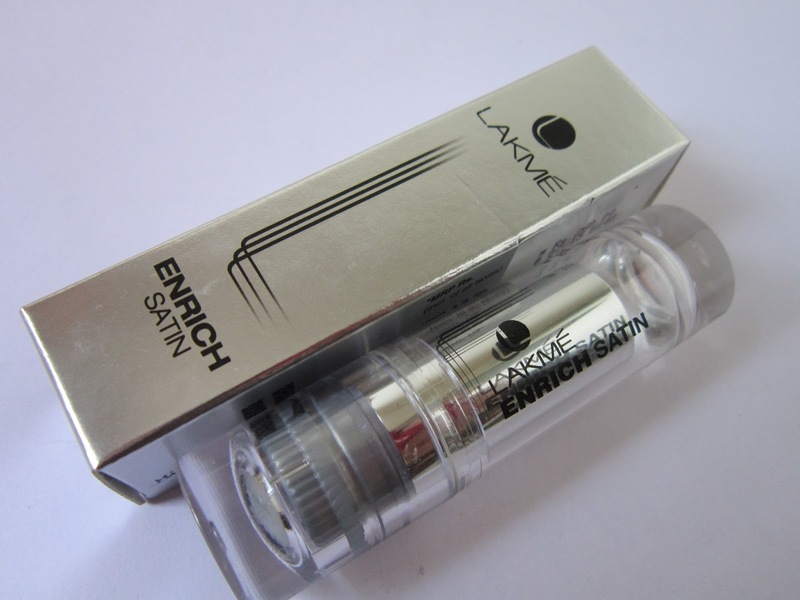 The shade is quite bright & is best suited for fair to medium skin tones. Rich, chocolate skin tones wouldn't like this shade much. As for me, I realized that the bright coral properties that the shade has, tends to stand out and as a result the mouth & chin area look a bit dull. So if you have pigmentation around your lips and mouth area, I suggest using a concealer to cover up the pigmentation first before applying this lipstick. I did that too. Yes, it does take some work but the shade is very pretty & if you're willing to put in an extra min or two...do get this shade!! Hope you liked this review. 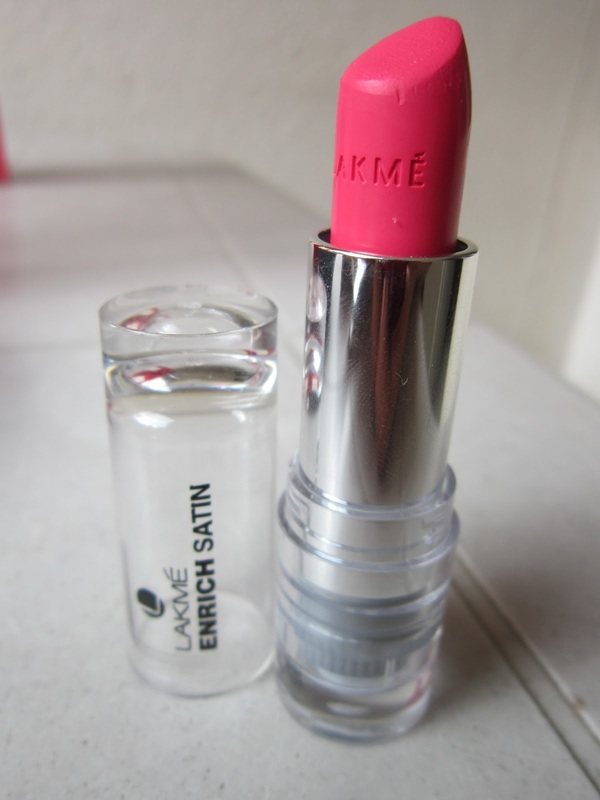 Have you tried out the new Lakme Enrich Satin Lipsticks? Which ones do you like? Leave me comments to let me know your thoughts.